The principle of nonmaleficence requires that every medical action be weighed against all benefits, risks, and consequences, occasionally deeming no treatment to be the best treatment. In medical education, it also applies to performing tasks appropriate to an individual’s level of competence and training. Students, residents, and attending physicians alike maintain a beneficence-based responsibility to patients, and attending physicians have a fiduciary responsibility to educate younger generations of doctors. Within the history of medical education, the identification of ethical standards for the profession predates even the idea of educational standards for medical schools or residency programmes (1). The American Medical Association (AMA) was first created in 1847 with the primary goal of raising ethical standards of medicine in the United States. In 1858, the AMA Counsel of Ethical and Judicial Affairs was established in order to implement an ethics code for the American medical profession (1). Both of these institutions arose before the Association of American Medical Colleges was founded in 1876, before the first residency programme was established at Johns Hopkins Hospital in 1889, and before the Flexner Report was published to assess the quality of medical education in the United States in 1910. In other countries around the world, there was a parallel identification of ethical standards in the profession of medicine (2). The accepted position in the modern era is that medical education in the modern era has prioritised patient-centred and ethical care since its inception. Intrinsically linked to the ethics of medicine is the physician’s role as a healer, not simply as one who cures disease. It is the interplay between this role and the principle of nonmaleficence that allows physicians to strive to identify the goals of treatment for each individual person they are caring for. The management of end-of-life care is an often-cited example of this. An experienced, non-maleficent physician will help guide each individual person and their family through these challenging and difficult decisions. In so doing, the bioethical principles of nonmaleficence, autonomy, beneficence, and justice are also fulfilled. These principles have been established and promoted as the core institutional values of the medical profession for decades. During training, medical students and residents must learn not only the abstractions of physiology and pathology but also the humanism embodied in their chosen profession. The core bioethical principle of nonmaleficence requires that physicians do no harm to the people they have pledged to help (3). Consistent with the classic Latin phrase primum non nocere (“first, do no harm”), this principle reminds practitioners that the benefits of medical action should always be weighed against all risks and consequences and that occasionally the best treatment may be no treatment. In medical education, “do no harm” can also be applied to performing tasks appropriate to the individual’s level of competence and training, where each participating agent maintains responsibilities derived from their qualifications. As such, students or residents may violate this principle when they act prematurely and perform tasks outside of their respective scopes of practice. For example, during training, medical students may need to learn how to obtain peripheral intravenous access. However, practising this skill may potentially result in unnecessary patient morbidity, through actions such as prolonged procedure time; repeat procedures; and increased risk of haematoma, contamination, and infection. Often, physicians-in-training are unknowingly asked to weigh the patients’ rights to no harm with their own need to learn. In many cases, the solution to such scenarios is to permit invasive learning opportunities when the patients’ potential for loss or harm is judged to be minimal. For example, a new orthopaedics intern would not be permitted the opportunity to perform a complete open reduction internal fixation of a broken bone independently, a situation in which the potential for serious harm to the patient is great. However, they may be permitted a first-assistant position and allowed to perform the opening incision, a substantially less risky portion of the operation. These trade-offs are made daily, and throughout medical training, in order to attempt to maximise both patient safety and educational efficiency. By allocating low-impact roles to medical trainees, the industry has attempted to mitigate the risk associated with medical trainee involvement in patient care. This method operates under one of two assumptions: either (i) the tasks given to medical trainees are simple enough that little to no error can be made, or (ii) the tasks are such that any errors made would not result in an adverse patient outcome. In critically analysing these assumptions, it becomes clear that the first assumption is false. As an example, the relatively simple task of measuring blood pressure recently proved to be beyond the skill set of medical students across the country. In a study of 159 medical students from 37 different states, only one student was able to properly complete the eleven steps involved in taking blood pressure (4). More difficult to assess is whether the tasks assigned to trainees are those that permit error without causing adverse patient outcomes. Surely, a hypothetical situation can be drawn in which an inaccurate blood pressure measurement could prevent a patient from receiving the care they need. Data on the role of trainees in medical errors is challenging to assess due to the teamwork-based practice of medicine. However, in an analysis of 240 closed malpractice claims, it was found that trainees significantly contributed to medical errors, especially in the context of lack of supervision (5). Error in judgment (173 [72%]), teamwork breakdown (167 [70%]), and lack of technical competence (139 [58%]) were the most common contributing factors. Additionally, lack of supervision and handover errors were the most prevalent types of teamwork problems, and these errors disproportionately involved trainees (54% involving trainees versus 7% without trainees [P < 0.001] and 20% versus 12% [P = 0 .009], respectively) (5). These studies suggest that it cannot be assumed that tasks assigned to trainees lack potential for adverse outcomes and that it is untrue that the tasks are simple beyond the potential for error. Medical trainees are capable of causing adverse patient outcomes. How then do we reconcile their need to learn with the pledge of nonmaleficence? In addition to the betterment of patients, teaching hospitals and medical schools must prioritise the efficiency and utility of their educational pedagogy. Medical education must ensure a large quantity of information is adequately transferred to students in a short amount of time and that trainees are able to master new and complex technical skills allowing them to independently practise medicine. Furthermore, the quantum of available information—such as from the basic sciences, pathophysiology, and pharmacology—has exponentially grown in the past decades, while working hour restrictions have placed new time constraints on upcoming physicians. Few alternatives to “hands-on” human experience can assist in training a student in many of the technical skills they must acquire during their time in training. This scarcity of opportunities for the eager student to practice their new technical skills has even been the subject of historical controversy. In the 1788 Doctors’ Riots in New York City, city residents became outraged at the unethical procurement of corpses for anatomy dissection in medical schools and hospitals (6). Even in the present, opportunities for students and residents to practise hands-on medicine is a selling point for many medical schools and residency training programmes. Throughout the history of medical education, a tension has inevitably developed between the necessary clinical and technical training of medical students and the fiduciary responsibility of medical institutions not to harm patients (nonmaleficence); to act in their best interests (beneficence); to respect their choices (autonomy); and to do so without partiality to income, race, or creed (justice). Furthermore, a constantly evolving landscape of medical student and resident education poses additional challenges to today’s student or physician attempting to navigate this tension. 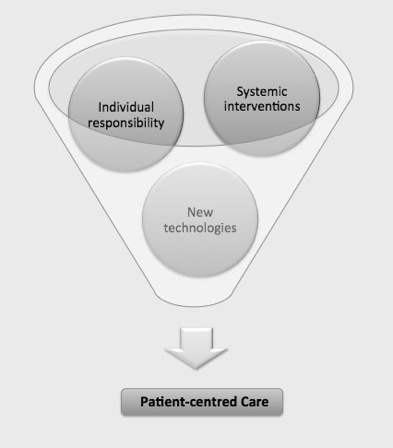 However, technical and regulatory innovation in the form of systemic institutional interventions, improved standardised assessment methods, learning modalities, and simulation centres, can provide new tools with which to optimise education with limited sacrifice of ethical patient care (7) (Figure 1). In the field of engineering, multiple systems for analysing process variation have arisen. One such technique was developed around 1924 by Walter Shewhart, a physicist, engineer, and statistician at Western Electric Company. He developed a system to assess process variation in the manufacturing process of telephone hardware. The types of variation he identified were called assignable cause (now known as “special cause”) and chance cause (“common cause”) variation (8). Shewhart proposed that common-cause variation occurs due to random variation in a system, the result of forces that are constantly active in a process. Conversely, special-cause variation is due to isolated alterations in a system and the result of changes in the system itself (9). Examples of special-cause variation could include a computer crash, technical machine malfunction, or uneducated employee. Correcting this type of error usually can be accomplished with educating the uninformed worker or replacing a broken machine. This can be likened to fixing one broken cog in an otherwise working machine. An example of special-cause variation may be predicting that your drive to work will take 15 minutes, but actually requiring 25 because your car was out of gas. This is a predictable, easily correctable variation in a repetitive process. Common-cause variation, on the other hand, is more difficult to identify and correct. Common-cause variation results from constant variation in a system and may be called process “noise”. This noise is hard to predict and hard to change. An example of common-cause variation may be predicting that it will take 15 minutes to drive to work but actually driving for 25 minutes due to traffic. This constantly active variation typically requires larger systemic or process-wide interventions to mitigate. These engineering principles can also be applied to medical education as it relates to ethical practices. Patient safety can be put at risk when trainees are involved in patient care. Some ways in which “do no harm” medicine may be violated when medical trainees are involved in care include having uneducated trainees who do not know how to be safely involved in patient care (special-cause variation). Additionally, larger systemic interventions can be undertaken to improve the safety of clinical environments for patients without the direct input or consent of individuals in the process (common-cause variation). It is most likely that the vast majority of medical trainees have no ill intent towards patients or desire to compromise patient safety for individual learning, and so it is often the requirement of medical systems to spend more time on the more difficult task of creating robust medical systems and systems of medical education that are dually efficient at educating young physicians and maintaining patient safety, at the same time. An often-forgotten task of medical training is to instil into developing doctors a sense of ethical responsibility for their patients. During training, all students have a professional responsibility to place the care of their patients above their own education. The nonmaleficent student acknowledges the limitations of their training and seeks appropriate clinical scenarios to practise clinical skills, with complete patient consent. Students and young physicians may inadvertently confer increased risks to patients when they choose to care for an individual before they have acquired sufficient clinical or surgical mastery. It is the responsibility of medical schools and teaching hospitals to instil an intrinsic belief into students that patient safety is a priority that exists a priori to the students’ right to learn. Special-cause variations that could lead to unethical treatment of patients include instances where individuals either intentionally or unintentionally act in a way that is contrary to patient safety. These special causes can be addressed and corrected by trainee education, in contrast to common causes of process variation, which require larger systemic interventions to be altered. A sound ethical practice requires trainees to be fully cognisant of their level of training and clinical skill—and to defer to supervising residents and attending physicians as necessary to maintain patient safety. In such situations, it is vital for students to be careful observers, actively striving to learn the new skills they observe. Students should learn to critically analyse each mentor’s style of care to identify practices that seem to be most successful in developing therapeutic relationships. Furthermore, all physicians have a professional responsibility for lifelong learning. Early in their careers, medical trainees should develop an investigatory attitude that continually seeks out better understanding of physiology, pathophysiology, and management options for all the disease states a trainee may encounter. Furthermore, maintaining respect for individuals is paramount for ensuring safe and ethical care. Individuals presenting for care in teaching institutions must be respected as autonomous individuals and must not be treated simply as objects for education or research without meaningful informed consent (10). Individuals should be made aware when students and trainees are involved in their care, and practitioners should fully disclose their status and experience level to their patients. This can be accomplished seamlessly at the beginning of the medical interview or preoperatively and does not require a substantial amount of time commitment. In developing healthcare systems and educational curricula that prioritise patient safety and education simultaneously, multiple checkpoints should exist to systematically eliminate the potential for patient harm. Some ways in which this can be incorporated into medical education include curriculum reform that lengthens clinical training periods. Many medical schools have transitioned, or are in the process of transitioning, from the traditional 2 + 2 model of training, where the first two years of medical school are spent as “preclinical” years in the classroom and the third and fourth years are spent on the wards, to a new 1.5 + 2.5 programme in which the transition into clinical medicine occurs at an earlier stage in a student’s training. Moreover, during the preclinical years, students should have the opportunity to engage with clinical scenarios through early exposure to the hospital system, observation during doctor–patient interactions in inpatient and outpatient settings, and early attempted communication with patients in a controlled environment. In theory, more clinical training should allow students increased opportunity to learn new skills from senior physicians. Additionally, the inclusion of an ethics curriculum starting in the preclinical years of medical training would add overall value to the system of education and prepare students for their clinical years. Other systemwide approaches to improving student training include implementation of standardised assessment tools and observed clinical scenarios with live feedback for trainees as well as protected teaching time for supervising physicians. In addition to formal clinical training, medical students learn passively from observing senior physicians in what could be called the hidden curriculum of medical education. Emulation of observed positive qualities is often beneficial for medical students and trainees. Conversely, when students observe and then repeat behaviour of seniors that is either medically unsound or medically unethical, the hidden curriculum may reinforce behaviour that is detrimental to patient care and can lead to patient harm. Regular faculty education and training may make senior physicians more cognisant of this hidden curriculum in medical education. One study from the Department of Surgery at Brigham and Women’s Hospital, Boston, MA found that coaching of senior surgical residents improved residents’ performance of nontechnical skills in a simulated laparoscopic cholecystectomy (P = 0.04) by using the Non-Technical Skills for Surgeons (NOTSS) behaviour rating system (11). This system allows evaluation of nontechnical skills in categories of situation awareness, decision making, communication and teamwork, and leadership. The system utilises video recordings of operative situations and allows surgeons to give feedback to trainees on non-operative aspects of surgery performance. Additionally, the study found improvements in outcomes such as time to call for help during bleeding, operative time, and ability of trainees to appropriately use laparoscopic instruments. Through initiatives such as these, structured observation and feedback can be built into medical training in order to improve communication and awareness between team members and safety for patients. The emergence of technological innovation in medical education has the potential to address ethical dilemmas in the education of trainees and simultaneously improve how we train the next generation of physicians. These technological advances have the potential of allowing trainees to become proficient in skills before performing them on people. Additionally, the recent invention and implementation of web-based medical education has radically altered the way medical students and resident physicians acquire their professional fund of knowledge. Virtual reality, simulation, and e-learning modalities have allowed trainees to adapt to the ever-expanding bank of literature available today. While the role of technology in the classroom has been well scrutinised, its potential for addressing age-old bioethical dilemmas in medicine has yet to be developed. As learning becomes further detached from the classroom, trainees have the opportunity to develop real-world skills long before they touch their very first patient. These advances may prove a useful way to mitigate the inherent potential for harm that exists in medical training. Simulation training has been shown to improve many aspects of medical training. One Harvard study found that simulation training combined with standard training of internal-medicine interns improved procedural protocol adherence during central venous catheter placement as compared to standard training alone (P = 0.024) (12). Another study, from McGill University, has shown that simulation-based training leads to long-term knowledge retention versus control training methods (13). In this study, trainees’ knowledge of electrosurgical safety was assessed immediately after the intervention and at three months and one year subsequently. Following the intervention with electrosurgical simulation, the intervention group had higher scores compared to controls at all measured time points: immediately (89% vs 83%; P = 0.02), three months (77% vs 60%; P < 0.01), and one year after completing the curriculum (70% vs 60%; P = 0 .02). These and many more studies have shown that simulation training is a beneficial tool for allowing trainees to gain both technical and team-based interpersonal competencies and to retain them for a greater period of time, which can lead to improved patient safety in clinical settings (Figure 1). Interestingly, one study found that when simulation learning was incorporated into nursing school training, students performed better on Objective Simulated Clinical Exams, although they did not feel more confident in their technical ability (14). Scores in the intervention group were significantly higher than in a control group (P < 0.001). The fact that confidence in performing procedural skills did not improve may suggest a need for continued repetitive instruction, even when tools such as simulation learning are employed. In addition to simulation training, e-learning has been shown to be an effective supplemental tool in medical education. E-learning is defined as the use of Internet-based resources in education. These resources may include online patient cases, digital anatomic modelling, online tutorials, and standardised educational videos that can assist in teaching a standardised curriculum to a large group of trainees, among other modalities. A 2016 systematic review identified e-learning as a beneficial tool in orthopaedic surgery training for improving outcomes such as preparedness for clinical procedures, performance in clinical skills and self-assessment of clinical abilities (15). Although these technologies have the ability to dramatically improve the way medical education is performed, they have some limitations. First, tools such as simulation centres can be extremely costly, which may make it prohibitive for many hospitals and medical schools to implement, especially in developing countries. Additionally, simulation technology has shortcomings, including the fact that simulated experiences may lack the feel of an authentic human interaction with a patient in a clinical setting. In this way, pre-programmed conversations may appear sterile to students and do not expose the student to the messiness and variation of real-life encounters. The use of simulation training and e-learning has been well studied in surgical settings (15). These advances have improved outcomes such as team communication, preparedness for clinical training, and patient safety (14, 15). In the future, these modalities should be further incorporated into medical training at an earlier stage, such as during the preclinical years of undergraduate medical education. In so doing, we can hope to improve team communication and clinical skills from the onset of medical training, leading to further reduction in harm to patients. These modalities have and will continue to shape the new landscape of medical education in the 21st century, and beyond, and have immense power to produce more competent physicians and interdisciplinary medical professionals. During medical training, involvement of students in patient care can lead to increased risk of harm to patients. Interventions at multiple levels can mitigate this risk. These include early ethics curriculum in preclinical years, early exposure to clinical encounters, continual faculty education, and new advances in technology that can help medical facilities train students in a safe environment. Nonetheless, students are, and will continue to be, responsible for patient safety in every action they take in training. By obtaining complete consent from patients for student involvement and practising clinical skills in a safe and observed environment, medical education can simultaneously promote education and patient safety. Zumla A, Costello A. Ethics of healthcare research in developing countries. J R Soc Med. 2002 Jun;95(6):275-6. Beauchamp TL Childress JF. Principles of biomedical ethics. New York: Oxford University Press; 1979. Rakotz MK, Townsend RR, Yang J, Alpert BS, Heneghan KA, Wynia M, Wozniak GD. Medical students and measuring blood pressure: results from the American Medical Association Blood Pressure Check Challenge. J Clin Hypertens (Greenwich). 2017 Jun;19(6):614-9. Singh H, Thomas EJ, Petersen LA, Studdert DM. Medical errors involving trainees: a study of closed malpractice claims from 5 insurers. Arch Intern Med. 2007 Oct 22;167(19):2030-6.
de Costa C, Miller F. American resurrection and the 1788 New York doctors’ riot. Lancet. 2011 Jan 22;377(9762):292-3. Blumenthal D, Gokhale M, Campbell EG, Weissman JS. 2001. Preparedness for clinical practice: reports of graduating residents at academic health centers. JAMA. 2001 Sep 5;286(9):1027-34. Shewhart WA. Economic control of quality of manufactured product. Madison: D. Van Nostrand Company, Inc;1931. Girdler SJ, Glezos CD, Link TM, Sharan A. The science of quality improvement. JBJS Rev. 2016 Aug 2;4(8). Jagsi R, Lehmann LS. The ethics of medical education. BMJ. 2004 Aug 7;329(7461):332-4. Yule S, Parker SH, Wilkinson J, McKinley A, MacDonald J, Neill A, McAdam T. Coaching non-technical skills improves surgical residents’ performance in a simulated operating room. J Surg Educ. 2015 Nov-Dec;72(6):1124-30. Peltan ID, Shiga T, Gordon JA, Currier PF. 2015. Simulation improves procedural protocol adherence during central venous catheter placement: a randomized controlled trial. Simul Healthc. 2015 Oct;10(5):270-6. Madani A, Watanabe Y, Vassiliou MC, Fuchshuber P, Jones DB, Schwaitzberg SD, Fried GM, Feldman LS. Long-term knowledge retention following simulation-based training for electrosurgical safety: 1-year follow-up of a randomized controlled trial. Surg Endosc. 2016 Mar;30(3):1156-63. Alinier G, Hunt B, Gordon R, Harwood C. 2006. Effectiveness of intermediate-fidelity simulation training technology in undergraduate nursing education. J Adv Nurs. 2006 Apr 21;54(3):359-69. Tarpada SP, Morris MT, Burton DA. E-learning in orthopedic surgery training: a systematic review. J Orthop. 2016 Sep 21;13(4):425-30.